When cultivators from prominent clans went out on night-hunts, there were usually crowds people who surrounded around them, appearing similar to a parade. Yet, Lan WangJi had always prefered being alone. This arm was quite strange, and could possibly harm other people if it wasn’t handled with caution. Therefore, he didn’t bring any other disciples of his sect, and took only Wei WuXian, watching him as close as he could. Wei WuXian originally wanted to sneak away during their expedition off the mountain. However, even though he attempted to run away multiple times, it always ended with Lan WangJi carrying him back with one hand holding the back of his collar. He changed his strategy, sticking to Lan WangJi as hard as he could. At night, especially, he would persistently climb into Lan WangJi’s bed, with the intention that Lan WangJi would become disgusted and use his sword to throw him away. Despite this, no matter how hard he messed around, Lan WangJi steadily stood his ground. Whenever Wei WuXian wriggled into his blankets, he would use a light slap to make Wei WuXian’s body rigid, and then stuff him into the other set of blankets in a proper position, where he would remain until daylight broke. Wei WuXian suffered a ton of losses and complaint about his sore body after he woke up. He couldn’t help but thought, Now that he grew up, he also became less fun than before. In the past, he would become shy whenever he was teased, not to mention that he did it in quite an amusing way. But now, not only does he remain unmovable no matter what, he even learned how to counterattack. How can this be?! Following the left hand’s direction, the two went toward the northwest. They duetted Rest every single day, in order to temporarily calm its anger and killing intent. As the travelled near Qinghe, the posture that the arm maintained to show them the way suddenly changed. Its index finger curled back, and it formed a fist. This meant that what the hand pointed at was just around the area. They inquired into the matter as they travelled, and arrived at a small city in Qinghe. It was daytime. The streets were crowded with people hurrying to and fro. Wei WuXian was trotting behind Lan WangJi when, suddenly, he was overwhelmed by the pungent fragrance of cosmetics. “…” The charlatan’s smile froze, thinking to himself, Are you joking with me? 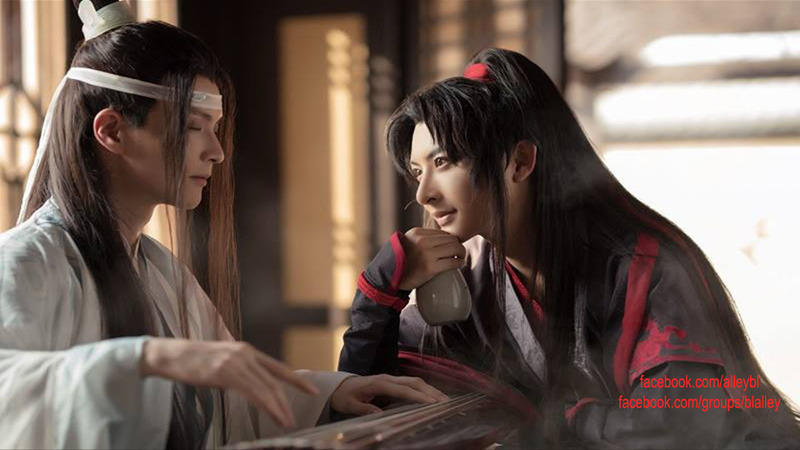 Wei WuXian replied, “If I don’t, you can give me money.” As he spoke, he extended his hand to search. He didn’t expect to actually find anything, but after a few moments, he did find a delicate, heavy pouch with money in it. This didn’t seem like something Lan WangJi would carry around at all. Then again, during these past few days, Lan WangJi did quite a lot of things that he could never have imagined. Wei WuXian didn’t even find it strange anymore and took the pouch at once. As he had expected, he could take anything from Lan WangJi if he wanted to, without the other becoming dissatisfied at all. If it wasn’t that he had a tiny bit of knowledge about Lan WangJi’s personal integrity and how good HanGuang-Jun’s reputation was, he almost doubted that Lan WangJi and Mo XuanYu had been involved in some helpless, chaotic entanglement of a relationship. Or else, why would Lan WangJi be able to endure it, after him going to such great lengths already?! After walking for some distance, Wei WuXian unintentionally turned around and looked. Lan WangJi was behind him, still standing at the same place, staring toward his direction. Wei WuXian couldn’t help but slowed his footsteps. He didn’t know why, but he vaguely felt that maybe he shouldn’t walk so fast, leaving Lan WangJi behind like this. Wei WuXian flipped through the stack of “The YiLing Patriarch’s Evil-Suppressing Portraits”. He really couldn’t accept that the scary-faced, hunky man was himself. As the charlatan was about to reply, Wei WuXian suddenly felt a gust of wind from behind. He dodged to the side. Jin Ling sneered and blew a short whistle. Wei WuXian didn’t understand the reason behind it, but, after a while, the heavy huffs and puffs of some sort of beast came from afar. With an immediate change in his face, Wei WuXian fled as fast as he could. Finding Lan WangJi after chasing this far, Jin Ling was shocked, Why would this lunatic show up alongside him again?! Lan WangJi had a serious personality and never chattered or joked. Even a few disciples of the same generation as him feel nervous when they see him, much less these juniors. His level of intimidation was even worse than Lan QiRen’s, back in those days. The dog underwent harsh training. Being different from the average dog, it was quite intelligent. As if it also knew that it couldn’t behave rudely in front of this person, it howled a few times, then hid behind Jin Ling with its tail between its legs. This black-haired spiritual dog was a rare species given to Jin Ling by Jin GuangYao. When most people heard that it was a present from LianFang-Zun, they didn’t dare to offend him. However, Lan WangJi was different from most people. He didn’t care for who gave it or who owned it, disciplining them all in the same strict way. As Jin Ling was using his dog to chase Wei WuXian down the streets and happened to be caught by Lan WangJi, his heart sank, It’s all over. He’d definitely kill the spiritual dog that I took such lengths to train, and then give me a harsh beating! Yet, Wei WuXian ducked under Lan WangJi’s arm and went behind him, seeming as if he wanted to climb up like climbing a pole. Feeling a pair of arms clasp around him, Lan WangJi froze for an instant. Taking this opportunity, Jin Ling blew two more whistles, and ran off with his black-haired spiritual dog. Door-gods: These are a type of god that is supposedly able to protect households. On the lunar new year, people often put up their portraits on their doors to fend off evil spirits. Spiritual dog: A spiritual dog is a dog which had been trained to gain near-human intelligence.